You can create screens to display data from databases, SharePoint lists, or Windows Communication Foundation (WCF) Rich Internet Application (RIA) services. 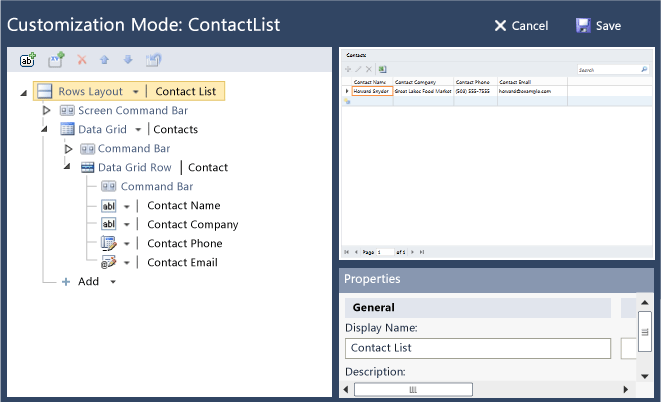 Screens provide the basic user interface of a Visual Studio LightSwitch 2011 application. To create a screen, just specify the kind of screen you want and the data you want it to display, and then let LightSwitch generate the screen for you. The generated screen will have the typical functionality of a modern user interface. You can tweak the appearance of the screen, enable or disable features, and add or remove commands. This topic introduces the templates that you can use to create screens, the tools that you can use to design screens, and some of the tasks that you can perform to design the right screens for your LightSwitch application. For information about how to choose a template, see Choosing a Screen Type. For information about how to find these templates, see How to: Create a Screen. You can modify the design of a screen by using the screen designer or by opening the Customization Mode screen while the application is running. The screen designer displays items such as data fields and commands, and the screen content tree, which is a hierarchical representation of your data. You can drag items to the screen content tree and arrange them in the order you want. For more information about the screen designer, see Tour of the Screen Designer. For more information about how to design a screen, see Walkthrough: Designing a Screen. For more information about how to perform specific design tasks in the screen designer, see How to: Design a Screen by Using the Screen Designer. The following illustration shows the Customization Mode screen. For more information about the Customization Mode screen, see How to: Customize a Screen in a Running Application. You can modify how data appears in a screen. For example, you can configure a collection of information to appear as a list or a grid. You can change the order in which fields appear, or group fields together. For more information, see How to: Design a Screen by Using the Screen Designer. For an example about how to design the appearance of a screen that displays information from the Northwind sample database, see Customizing Screen Appearance. LightSwitch screens provide built-in commands so that users can view, update, delete, or save data. You can also add custom commands and fields. Add a custom command if you want to add some kind of business logic to the screen. For example, you can add a button so that a user can view a list of customers based on sales order volume. For more information, see How to: Add a Custom Command to a Screen. You can add custom local properties fields to collect or display information. For example, you can add a text box next to the sales-volume button so that the user can specify how many customers they want to appear in the list. For more information, see How to: Add a Local Property to a Screen. You can add Silverlight controls to a LightSwitch screen. Use Silverlight controls to display or collect information in ways that go beyond the capabilities of the built-in LightSwitch controls. You can also use a Silverlight control to replace any built-in LightSwitch control that appears on the screen. For more information, see How to: Add a Custom Control to a Screen. You can filter the data that appears in a screen by modifying the conditions of screen queries. Every group of data that appears in the left pane of the designer is based on a query. The screen only displays information that is returned by those queries. To change the information that is displayed for a group of data, modify its query. For more information, see How to: Filter Data on a Screen. You can add other kinds of data to a screen. For example, in a screen that displays customers, you can add a data grid that shows a list of orders. For more information, see How to: Add Data to a Screen. In the application, a user can open a screen by clicking its name on the navigation menu. You can specify the order in which you want these screens to appear on the menu. You can also specify which screen is to appear when the application starts, and you can specify whether the user can open multiple screens that appear as tabs. For more information, see How to: Create Menu Items and Navigation Groups. LightSwitch provides built-in support for search. When your application runs, a search box is displayed above every data collection in a screen. A user can type terms in one of the search boxes, and then press ENTER to search for related information. For information about how to hide a search box in a screen, see How to: Design a Screen by Using the Screen Designer. For information about how to exclude specific fields from searches, see Reference: Data Designer Properties. Only fields of type String are considered in a search request. In addition, a search request only applies to the associated data collection. For example, a search box that appears above a customer collection cannot be used to search for information about orders that were placed by a customer. If you want to provide a search experience that considers non-string fields or information that exists in related collections, you must implement a custom search feature in your screen. For an example about how to accomplish this, see Creating a Custom Search Screen in Visual Studio LightSwitch. You can add code to partial methods that are called by LightSwitch so that when certain events occur at run time, the screen is modified appropriately. For example, you can add code that hides the name of a company that wants to remain anonymous to the users of your application. This code would examine the company names of customers and, when it finds a match, would set the IsVisible property of the CompanyName field to False before the information is displayed in the screen. For more information about where to write your code, see How to: Handle Screen Events and How to: Add a Custom Command to a Screen. For more information about how to add code that modifies a screen, see How to: Modify a Screen by Using Code. Describes templates that you can use as a starting point to create screens. Shows how to add screens to your application. Illustrates the parts of the designer and their functions. Shows how to design a screen that displays data from the Northwind sample database. Shows how to use the screen designer. Show how to customize the appearance of a screen while the application is running. Shows how to add a custom local propertyfield to a screen. Shows how to add a button or link that executes custom code in a screen. Shows how to create a control outside of LightSwitch, and then use it in a LightSwitch screen. Shows how to add data from other queries to a screen. Shows how to use queries to control which data appears in the screen. Describes how to customize your application by writing code that is executed when certain events happen. Describes how to use code to modify controls and interact with items on a screen. Describes the properties of items that appear in the screen members list and the screen content tree of the screen designer. You can modify the appearance and behavior of items by using the Properties window to set the value of the properties.